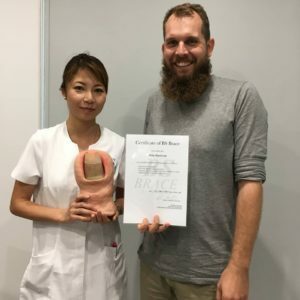 We held a BS Brace workshop in Brisbane in November. By attending our BS Brace 1-Day Workshop, you qualify to administer BS Brace corrective nail braces. In the workshop, participants will learn the theoretical and practical aspects of BS Brace Ingrown nail treatment. On this day, a participant was Philip, a podiatrist of Pioneer Podiatry in Mackay, QLD. He joined the workshop through an introduction by his friend podiatrist. He prepared the BS Brace practices by watching our DVD before the day, so he caught on fast and very good at brace application. Afterwards we issued a certification of BS Brace for Philip. 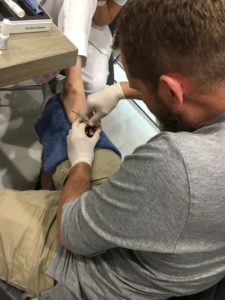 Yes, he will be able to provide his clients with a gentle treatment to fix their ingrown toenails. In order to maintain quality and to ensure proper treatment is given to patients, we hold workshop to focus on the technical side of BS Brace and cover both skills involved and the knowledge of the product.